· & #x1F340; Due to photography limitations and unavoidable differences in monitor settings, the colors shown in the photograph may not correspond 100% to those of the same. · ❤️ Welcome to the Zaru store, I hope you have a good time to go shopping! ^_^ ❤️ ❤️ Features: ♬ Specification: 3.7V 1200mAh 25C Lipo battery ♬ Playtime for X5C: 18 min and 50 seconds ♬ Playtime for X5A: 20 min and 40 seconds ♬ Charging time: about 100 minutes ♬ Cable length: 35 mm (35mm) - Battery dimension: 50MM * 23MM * 5MM - Upgrade to 1200mAh, longer flight. 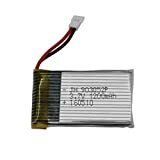 Suitable for Syma X5A, X5C, X5SC, X5SW-1, X5SW, JJRC H5C, H5P, RC Quadcopter ♬ Package Content: 1 x 3.7V 1200mAh 25C Lipo Battery ❤️ Shipping: We ship from China, usually takes 15-20 days to arrive.Our product is good with a reasonable price and we believe it will be worth it. Please wait patiently! If you have any questions, please contact us kindly and we are committed to working hard to help you solve the problem. ❤️ Service: If you are not satisfied with the item you receive, please contact us, we will fulfill your satisfaction.